The first time I heard Chuck Berry was in 1972, over a jukebox in Cafeteria II, one of a pair of huge cafeterias at Cherry Hill High School East in Camden County, New Jersey. I was a humble freshman. The tune was “My Ding-a-Ling,” a song of none-too-subtle double entendre that, incredibly, was Berry’s only #1 hit. I thought the song was stupid. (Actually, I still think it’s stupid.) 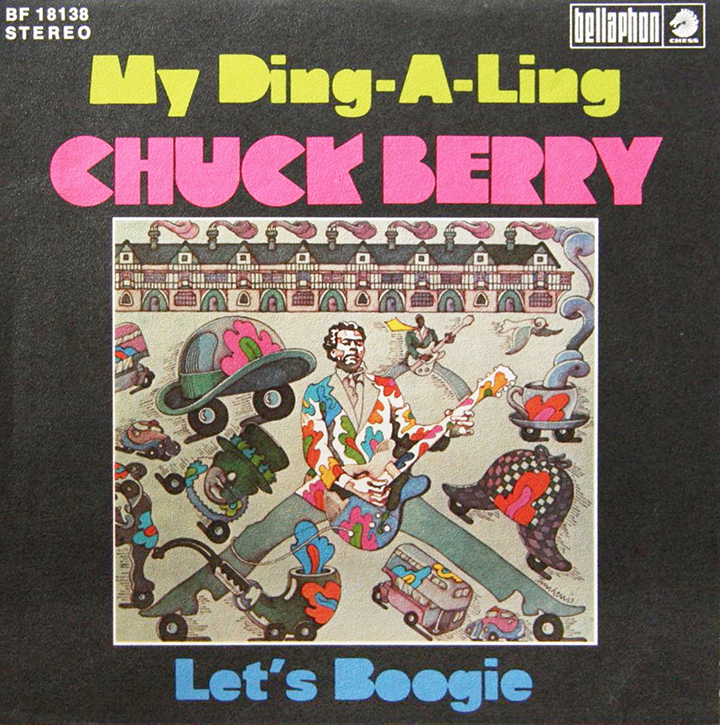 So “My Ding-a-Ling,” of all songs, was my first impression of Chuck Berry. My next exposure to Berry happened indirectly, through another guitar player. In the ’70s, there was this nutty 1950s craze goin’ on. Kids wore grease in their hair and listened to oldies. (This is where “Happy Days” eventually came from.) At East, they started throwing ’50s dances. One Friday afternoon, to promote that night’s dance, a high school group played a few songs in that same cafeteria. They called themselves Sonny Goldfin and Heaven. I heard them do “Johnny B. Goode”— the first time I’d ever heard the song. There seemed to be an electricity, an alive-ness, to the song. For the rest of the day, I kept hearing “Go, Johnny, go!” in my head. And I kept hearing that guitar riff — you know the one I mean. Heaven’s guitarist was a long-hair who wasn’t trying to look like a ’50s dude. I never learned his name, but he’s the guy who introduced me to Chuck Berry-style guitar. I saw Chuck Berry one time only. It was a double-bill with Little Richard at the Sovereign Bank Arena in Trenton on Sept. 13, 2003. I’d gone to a lot of shows by that time. I don’t mean to imply that I was taking it all for granted, but I’d seen most of my heroes in concert, some of ’em many times each. So maybe I wasn’t as “in the moment” as I should have been just before the show started. Thankfully, I got cured of that in the nick of time. 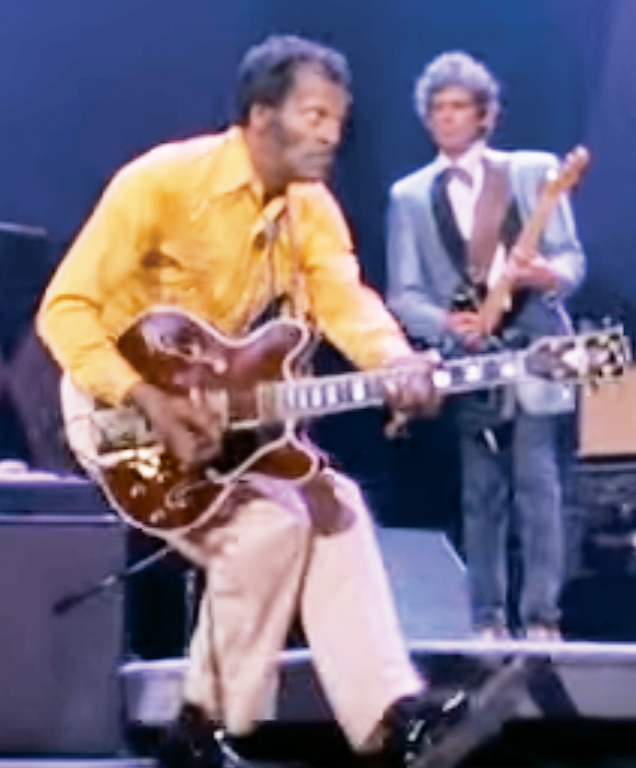 Chuck Berry duck-walks past Keith Richards in the concert film “Hail! Hail! Rock ‘n’ Roll” (1987). A second or two later, Berry nonchalantly walked onto the stage and started fussing with equipment — it was dark, but we could see him — and my new friend exclaimed, “Oh my God, that’s Chuck Berry!” If he hadn’t have said that, and with such unbridled enthusiasm, I might not have had my own “He’s right! Oh my God, that’s frickin’ Chuck Berry!” moment. But I did. Thanks, stranger. Chuck, then around 76, put on a phenomenal show that night. He didn’t phone it in. The rock ‘n’ roll just poured out of him. I remember he did a bit in which he invited folks to dance onstage. (Apparently, this was a regular shtick.) So, there were 30 people onstage, all dancing like maniacs, while Chuck played an extended solo. I didn’t pay attention to the civilians; I just kept my eyes — and especially my ears — on Chuck. He was playing, like, a 12-minute guitar solo! No record company would have put a solo this long, with its inherent redundancies, on an album. But here it was, live — a precious, unpreserved interlude. Chuck Berry, playin’ the guitar just like a-ringin’ a bell. Elvis Presley, who is called the King of Rock ’n’ Roll, sang, strutted and played guitar onstage. 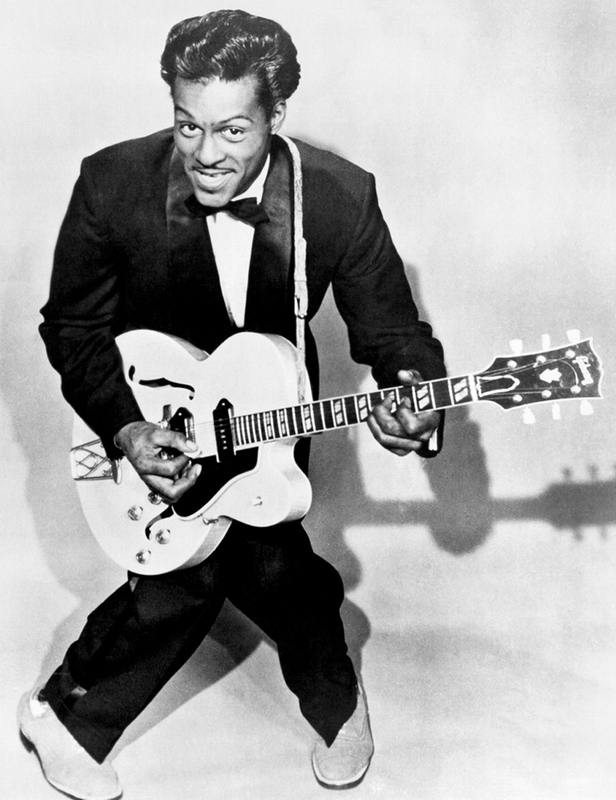 Chuck Berry did all that, too, but with an important difference: It was real guitar. Real, raunchy, punch-in-the-gut, rock ’n’ roll guitar. To me, Chuck was the first musician to really step out in front with an electric guitar, and rock out. He sang about cars and schoolgirls and a boy who used to carry his guitar in a gunny sack. Keith Richards always gave it to Chuck, and that’s good enough for me. With the news that Chuck Berry died on Saturday at age 90, there was an instant feeling that a chapter in rock ‘n’ roll history was over. That a Founding Father was gone. P.S. : I think I’ve narrowed that mystery Heaven guitarist down to two possible dudes. (I found this out on that modern marvel, the Google.) A bassist named Bill Saltzer, who did a lot of gigs with our old friend, producer/keyboardist extraordinaire Joe DeLuca, was apparently a member of Heaven in 1972, and he remembered the lineup: himself on bass; Sonny on vocals; Pete Rapetti and Charlie Turner on guitar; and Jim Higgins on drums. Now, if I can just ask my brother to ask Joe to ask Bill who would have played lead guitar on “Johnny B. Goode” in Cafeteria II at Cherry Hill East on a Friday afternoon in 1972, I could finally, finally thank that gentleman for introducing me, so to speak, to Chuck Berry.